James Hooper Is Back To ‘Nonsummit’?! [by Woorim Ahn] Former member of JTBC ‘Nonsummit’ James Hooper will appear in New Year’s special of the program. 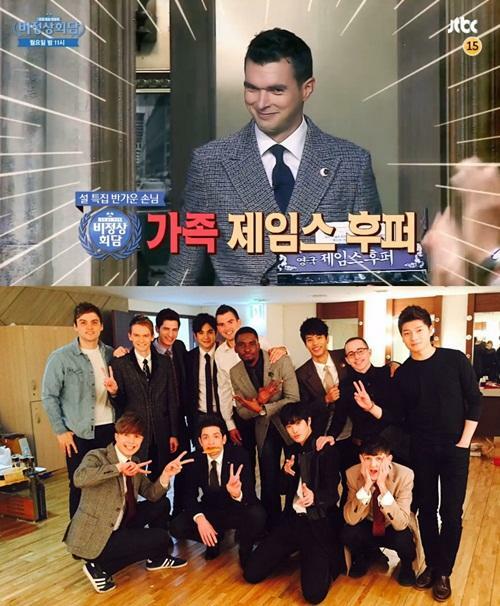 During filming the 33rd episode of the program, James who left to Australia for studying showed up as a guest and met the members. James Hooper has a record of the youngest English climber who went up to Everest at the age of 19 and in 2008, he was chosen as the ‘Explorer of the Year’ on National Geographic. On July 28, 2014, he said, “I’m leaving to Australia to study” and left the program. MC Jeon Hyun Moo asked, “Did you watch ‘Nonsummit’ after you left?” and James answered, “After I left the program, it gained so much popularity so I didn’t watch it” and made the hosts laugh. James continued to talk about ‘Family trip and Slow life’ with the members on that day.